This beautiful house was built in the 1800’s. 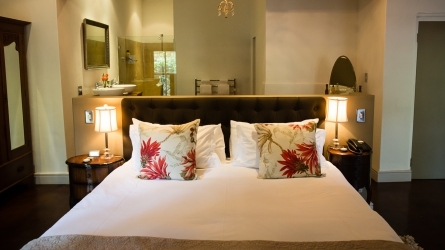 Adjacent from the main building, its newly built suites has their own private entrances, top of the line fittings and plush furnishings. 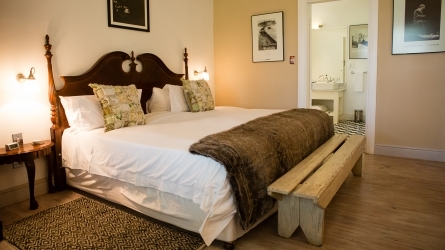 Room 6 – Has the original wooden floor, a long-length king-size bed (can also be made up as twin beds), percale linen, air-conditioning, coffee and tea facilities and stocked mini bar. The en-suite bathroom with opulent bath, oversized shower, the toilet and bidet also has underfloor heating. Enjoy the large porch area for private dining and lounging. This room also has an extra single bed in the entrance hall to accommodate a child and/or a cot can be put in here for infants. Orchard view. Room 9 – Is for those who desire extra space. This open plan bed and bathroom will spoil you with a king-size bed, percale linen, coffee & tea facilities, stocked mini bar and air-conditioning. The open plan bathroom has a claw foot bath, large shower complete with en-suite toilet & bidet. Orchard view.